*Note: Yesterday’s post may not have gotten sent out to all subscribers, so here is the link to Day 23 if you missed it. Today’s entry will be fairly short as it wasn’t a super detailed day. 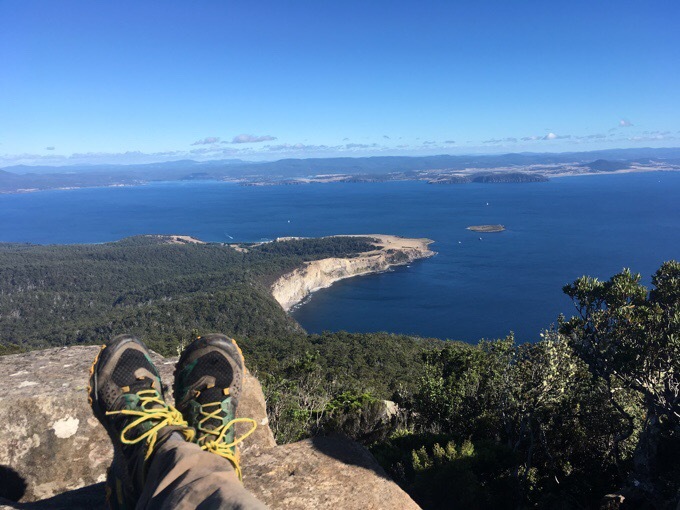 We did a morning hike on Maria Island called the Bishop and Clerk. A nice 12km/7.5mi walk up to a viewpoint overlooking the island. 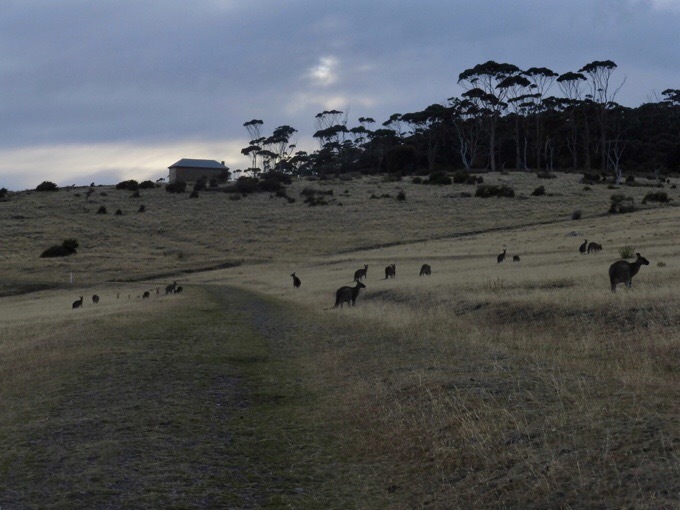 On the way up, there was a whole field of what we think are called Forester kangaroos. It was fun to watch them all. I even attended my first Australian sporting event when we witnessed a boxing match between two large males that was quite entertaining. 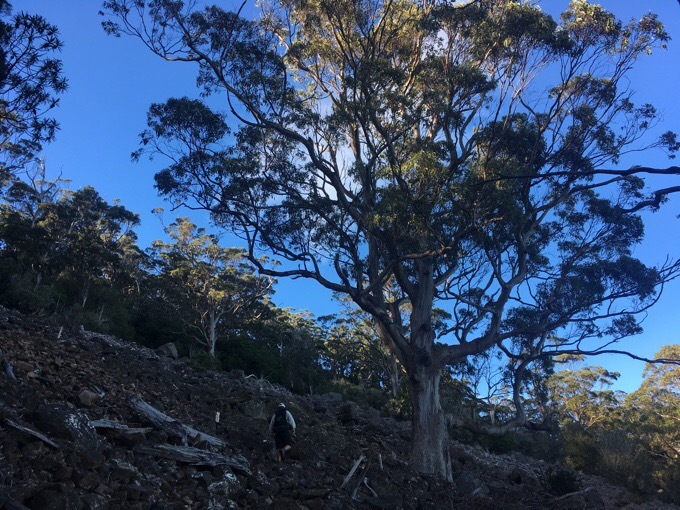 The rest of the hike was a steady uphill that started in open grass, then forest, and finally some rocky terrain and rock scrambling to the top. We returned to our tents and got a bit of time to lounge before leaving on the 2:30pm ferry back to the car. 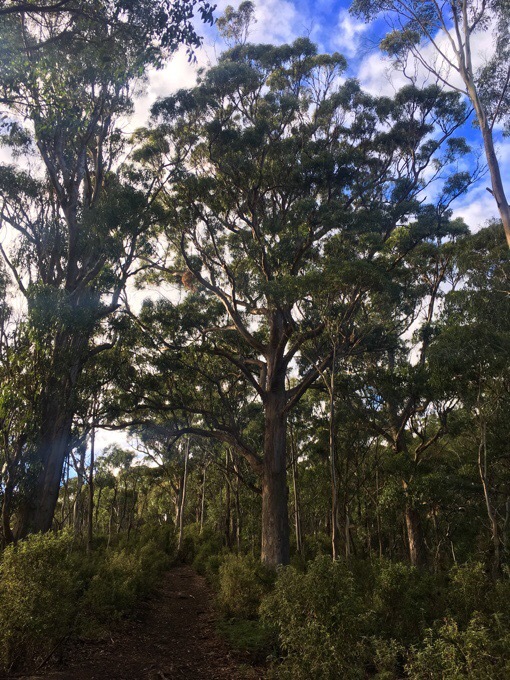 Maria Island is a simple and relaxing place. There is a lot of animal life and just a handful of day hikes to do. I wouldn’t put it at the top of the list, but it is relaxing and calm. Seeing the Painted Cliffs yesterday was definitely the highlight, but I will warn that the ferry was $42AUD/$33US roundtrip. Camping was randomly free the day we were there, but I think it was just $7AUD/night. If people are seeking a simple place to relax and get away, it’s nice, but it doesn’t have scenery as grand as other places we’ve been. The abundant animal life was entertaining. 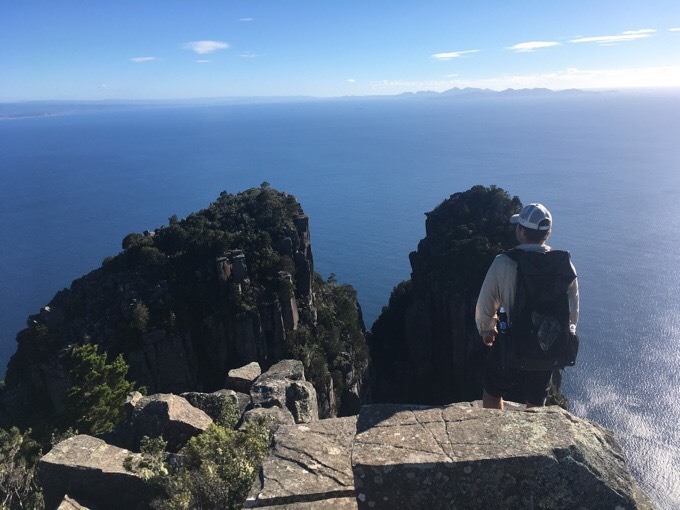 A good experience to have while we are out here, and a nice farewell to the coastal hiking in Tasmania. Our wide winged tour guide. 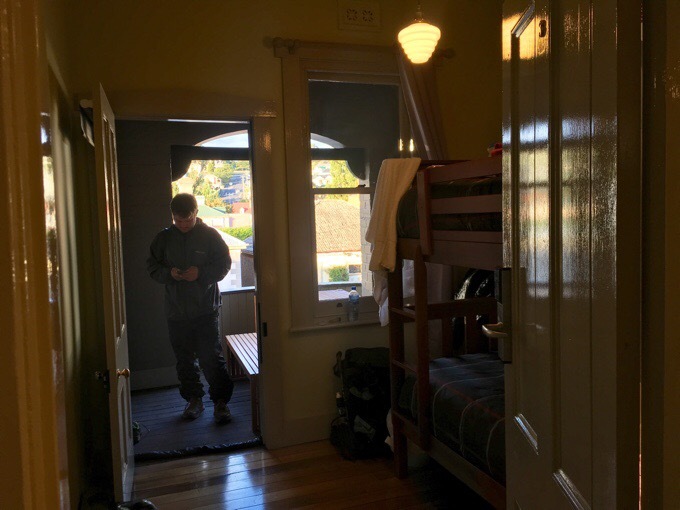 We did the 1.5hr drive back to Hobart where we checked into a small hostel called the Tasmanian Inn. It’s just a few rooms above a restaurant, and may be New because they were very eager to please and very accommodating. They even did our laundry for us when we falsely assumed they’d have machines for use (it had been 10 days since we did laundry). Best of all, the room included a ticket for a free drink from the bar downstairs. When I asked if they could substitute that for a chocolate milk, they said yes, and I later found out that they went to the store to get it special for me since they didn’t have any. Plus, the wifi works great and they give a continental breakfast that they set out at night and told us we could come down through the night for if we want a midnight snack. They must not realize what hikers are capable of eating. Very nice people and a great choice for the next two nights. We will be in Hobart all day tomorrow still waiting out rain. It looks like things may land perfectly as a full week of clear weather is projected inland starting in two days. 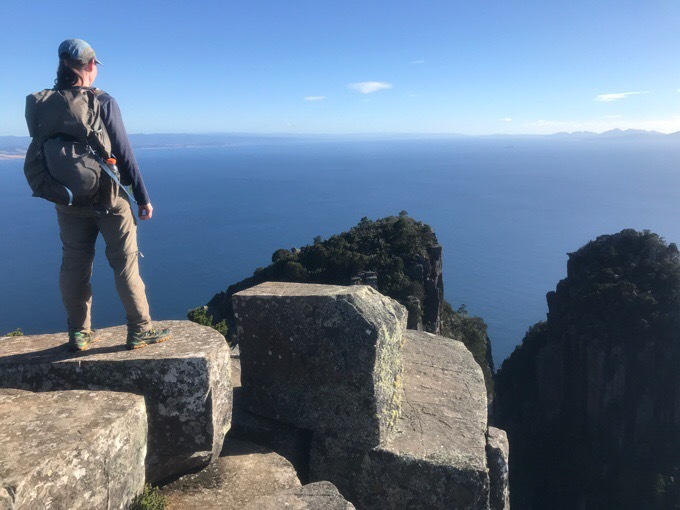 That gives us just the right amount of time to do the final two hikes on our list. The Western Arthurs and Mt Anne. 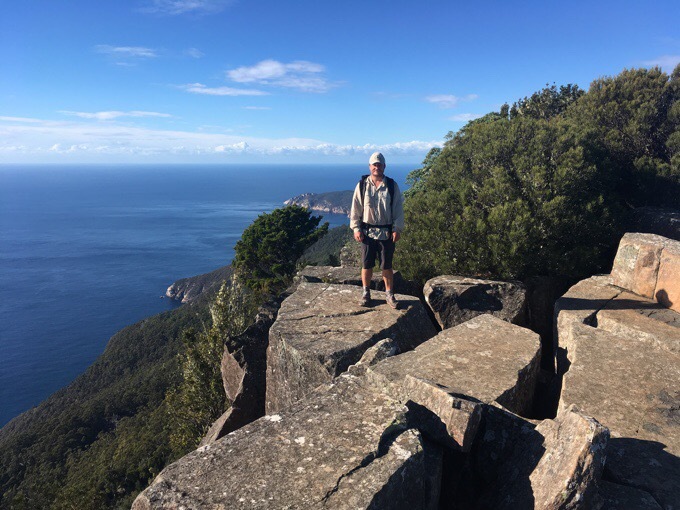 Both are challenging hikes that require clear weather in exposed terrain with much rock scrambling. Ending it with a bang! 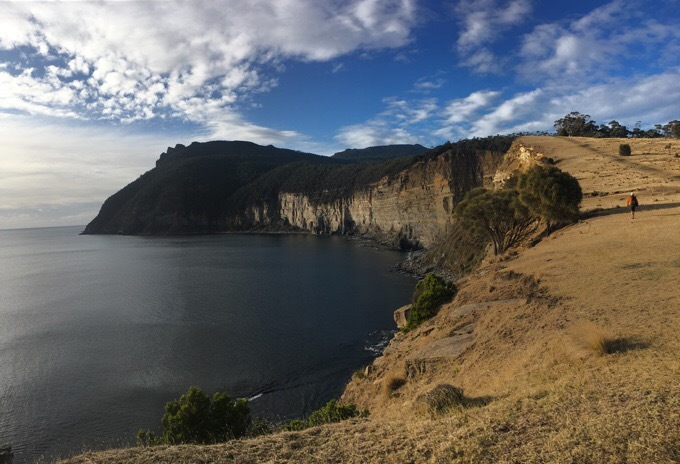 So, tomorrow we will spend the day in Hobart going to the famed MONA museum of modern art and I get to see Beauty and the Beast. It will be a great day off! I got to watch the latest episode of Survivor tonight. Oh man, talk about entertainment! What a great season, and it is just getting started! That’s some Nat-Geo stuff right der! Did you notice that the match was over once the roo on the right bowed down. This is a submission pose. A well know Aussie bushie Malcolm Douglas (sadly no longer with us from a vehicle accident) demonstrated this with a big Red kangaroo. He stirred it up until it wanted to box on then he just bowed down from the waist and it was all over the big Red lost interest strait away. I have read of others confronted by a grumpy roo doing the same thing and it work for them too. If you decide to get close keep this in mind as they are not as cuddly as you might think. Yes, I noticed that. It happened a few times not on video. Interesting that it works for humans as well. 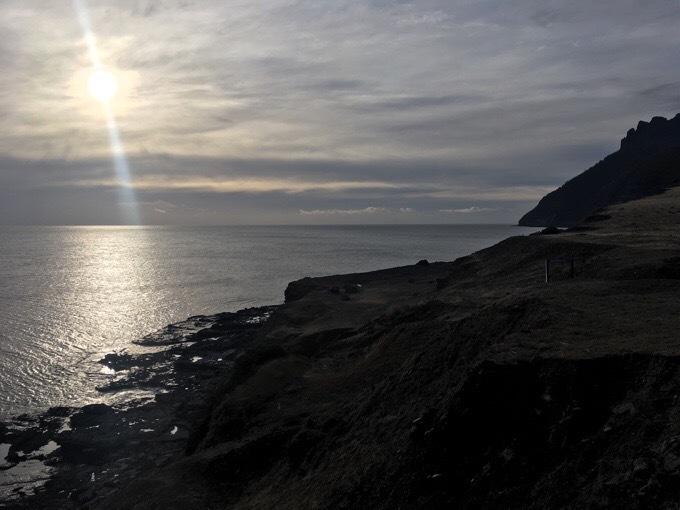 The coastal views look pretty inspiring. And I note your shoes look like they are doing well! Good for you. 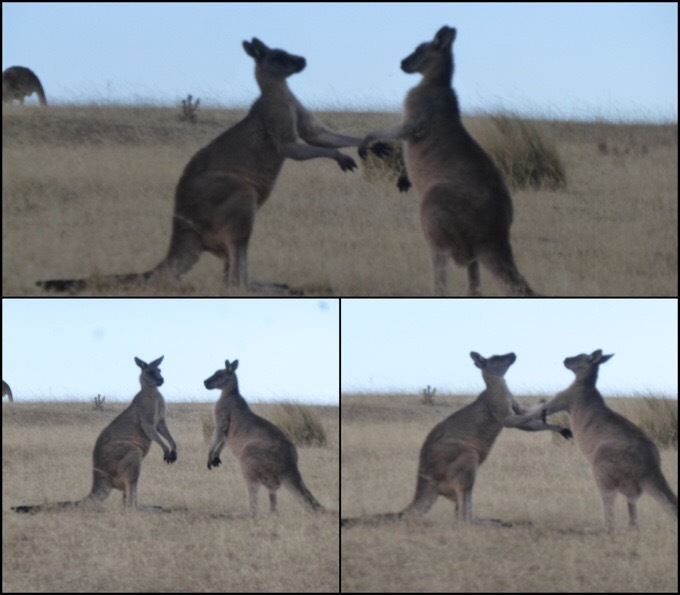 Boxing roos. One thing I noticed is that their tails are very strong. When they kick they lean back on their tail for support. 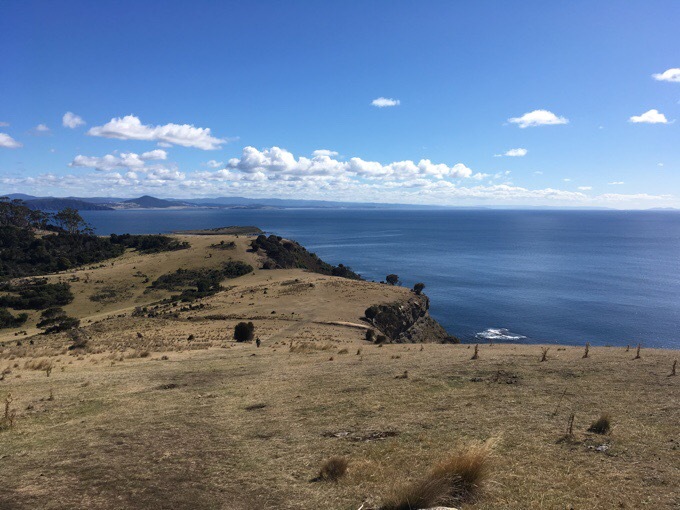 -Good to know about the submission position if I’m ever in Tasmania! Amazing balance on the roos.. They look quite tall, but would need someone for comparison. Like Naked Hiker Guy ? Haha, they are really tall. Like 7ft tall. 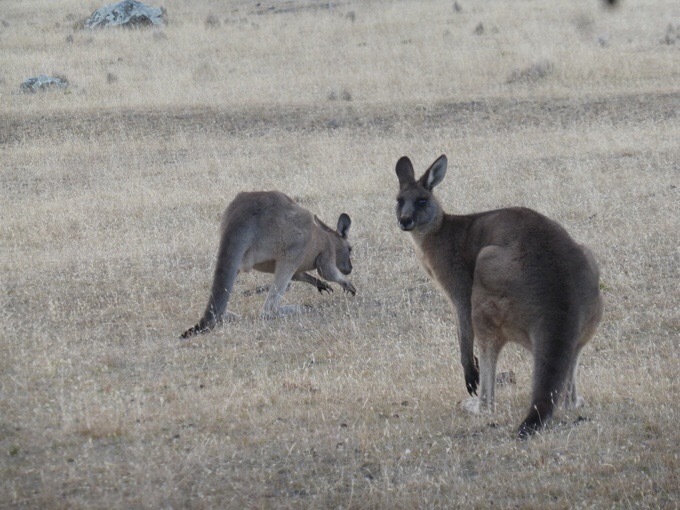 Boxing Roos are quite cool, good to watch, glad you two got to see them. 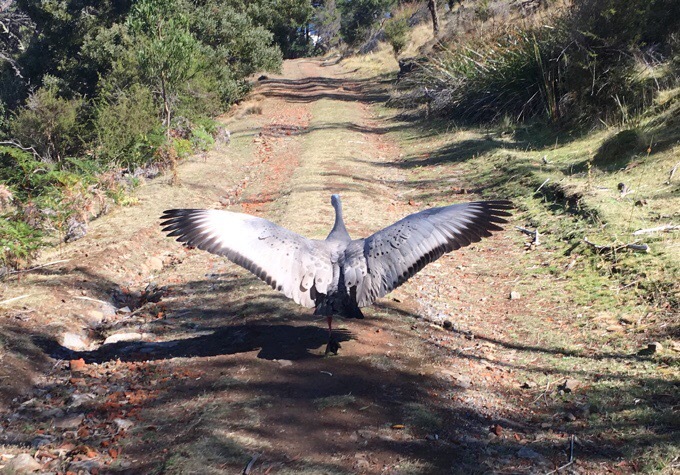 Your tour guide is a Cape Barren Goose 🙂 As usual, great pics. I wonder if the Roos teach a class at the local gym? It would be a way to spice up my exercise routine! !